1aim, a German startup, is building a “ground up” AI platform for offices that combines physical security with artificial intelligence. From securing the actual locks in the doors, to optimizing conference room usage, the company intends to turn any building into the kind of place Marvel’s Tony Stark might work. Smart locks make a lot of sense once you wrap your head around the concept. With 1aim’s system, administrators can use a simple app interface to issue digital passes to anyone they want. This could mean sending an email invite with a one-time pass to your poker buddies so you don’t have to get up and answer the door. The product is designed for enterprise though, so having the ability to tailor access to specific doors, rooms, and areas without having to manage badges or physical passes is the scaled benefit. The locks, in this system, can be retro-fitted to any door type and they’re opened by waving a smartphone in front of them – taking advantage of a proprietary encryption system involving randomized colors and light – which makes it far more secure than keys or badges. Unless your company uses keys with as much security as an iPhone, this is an upgrade to traditional systems. But, smart locks aren’t new or special, and we certainly don’t need AI to control them. Businesses know nothing about how efficiently they use their space. Why? Because there is nothing in traditional security that would have allowed them to optimize how they use their space. We allow them to record the crucial data they need for this optimization and the rise of AI makes it possible to make good use of that data. When you start trying to imagine how to properly utilize hundreds of rooms across dozens of departments in a building where, for example, researchers and guests filter in and out 24 hours a day, the idea of managing it all can seem daunting and incredibly complex. Which is why an AI system with a simple interface trumps the traditional bulky hodge-podge of computer check-in, RFID badge encoding, and handing out keys. What does Google analytics do? It shows you how your website is used, where people go, which links they click on, how long they spend on each page, and what they finally see that causes them to leave the page. Companies managing buildings today are like Web developers coding without Google analytics. They do guess work, they are poorly informed, and they have no idea what they are doing. With our data collection and building analytics tools, you will have access to the same quality insights about your building that Web developers have been using for ages to optimize websites. With 1aim’s platform, businesses will be able to provide and revoke digital keys in real-time, and gain deep insights into who is going where, and how well every space is being utilized. These insights will come from AI that’s supported by server-side infrastructure. This is the the future we’ve imagined since “Star Trek” in the 1960’s, where a computer controls access to all the doors and monitors where everyone is. The one thing we forgot to ask Friehe was whether his system would have the ability to add that classic USS Enterprise “whoosh” sound whenever a lock was opened. 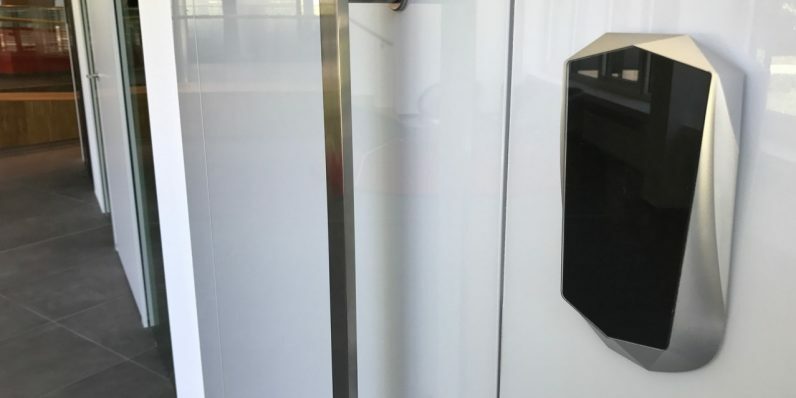 You can check out 1aim’s Light Electronic Access Lock on Amazon, and you can get more information on how the company can turn your boring office into an AI-powered headquarters at its website here.